I work across the shop from the Service Express lane. Seeing my car on another lift made me very tense. I am the only one that has worked on that car in about 70,000 miles. The last guy that worked on it is one of the team leads in the shop, and the BEST mechanic we have! Now guys that are as rookie as it gets are working on my car. The whole idea behind S.E. is to be fast. When the program is in full swing, it will take about 20 minutes from start to finish. Since the boys are still learning, it took about an hour and a half. The oil change on a 1.8t Passat is not the easiest oil change. If you don’t do it just right, it makes a HUGE mess. After they finished the service, I thought it would be a good idea to do a little quality check. Turns out they didn’t do such a great job. The checks they perform(lights, tires) were perfect. The oil change, not so much. There belly pan was covered in oil, a clip was installed wrong, and they broke the air box. The oil and clip were a really easy fix. Just some clean up. 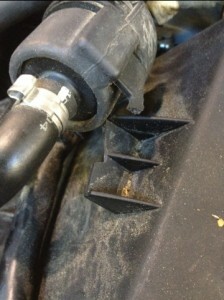 The airbox however, will need to be replaced. It was nothing that would effect performance, but I get OCD so I need to fix it. I don’t want to sound like I am giving these guys a hard time. This was actually a really great teachable moment. I showed them what they did, and how to do it properly for next time. I am pretty sure they got what I was saying, they might have been a little scared ;). It is also a good thing that it was my car(not really for me). I would much rather them be able to make a mistake, and see the result right away. This worked out great because we did not make a customer unhappy. I will be sure to keep everyone posted about their progress. It will be fun to follow along while they learn the ropes! Driving Enjoyment, It Doesn’t Have To Be A Volkswagen. Kevin, the headlights are AWESOME! That sounded a bit traumatic. You’ll have to take your passet out for a wash and buff to cool the danger wagons nerves. I don’t think she is very happy with me. I will get her cleaned up and take her on a great drive. My poor Passat.. I don’t even know who you are anymore!!! You must not have seen the before and after of my car’s headlights. I’m just amused that I was referring to the same car (engine) in the last post comments for something I would happily take to the Express guys. I try to get other guys in the shop to change my oil. For some crazy reason, no one wants to! That is my least favorite thing to do on a 1.8t!